I’ve been looking on and off for a good giant model for my Orc and Goblin army for quite a few years now. I was never impressed with the Games Workshop giant, it looked far to gormless, flabby and non-menacing. The Forge World model was larger, but still didn’t impress me, and obviously nor did it’s 3 figure price tag. I’d looked into other manufacturers, but most of these were older metal models and the giants weren’t usually much bigger than trolls. Anyway, after searching for that Fire Elemental (The D&D collector’s series Fire Myrmidon in my last update) I realised they did a few limited edition giants. The Storm Giant looked a little too ‘ancient greek’ and the Fire Giant had molten armour on (although it’s a fantastic model). I opted for this Frost Giant. I won’t be painting it with blue skin like a D&D frost giant. It will get human coloured flesh with an assortment of leather patched armours. It was only a 7 piece resin model and didn’t need much cleaning up either. 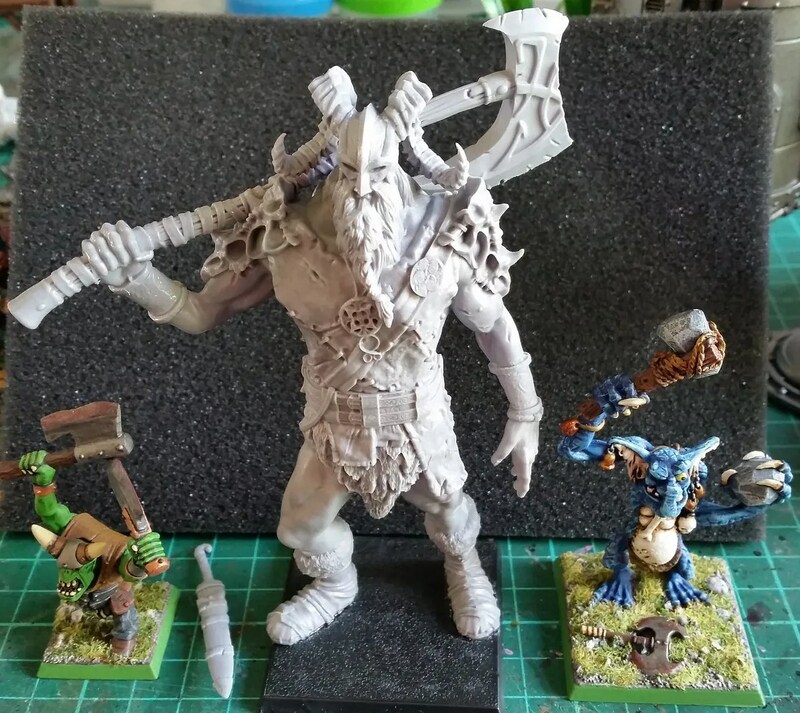 The photo shows the size compared to an orc and a troll. Perfectly huge, but it fits on a 50mm square base. A excellent addition to the Orc and Goblin armies I’m (still) painting for Kings of War.